If you’re familiar with Redux, you probably know that it may ease your life with your app architecture a lot. It’s great tool for separating your presentation and business logic. But what about the combination of Flutter, Redux and animations? In this article, we’ll use flutter_redux package. We can add and remove products from the list. As you can see, when we add some products to the empty cart, we’d like to show bottom bar with slide in animation. And when all products are removed, we’d like it to disappear. Check full source code for this file on GitHub here. As you can see, right now we don’t have any fancy animation (actually we don’t have any animation at all). To make it work, we need to make a few changes in our widget. Show me some nice animation! We need to make widget stateful, because in later steps of implementing animation we’ll need something called SingleTickerProviderStateMixin. This mixin prevents Flutter animations from consuming resources when it’s no longer needed (e.g. it’s not visible anymore). You can read more about implementing animations in general in Flutter Animations tutorial. In the beginning, we firstly have AnimationController , which is responsible in general for running and controlling animation — starting, stopping, pausing, and so on. Note: screen position starts in the left top corner and increases as going to the right bottom corner. So if we’d like to hide the bottom bar, we need to decrease position value. To run animation, we’ll simply call forward() on the controller. And at the end, we should call dispose() on AnimationController when it’s no longer needed. If we want to run animation in the opposite direction, we’ll use reverse() method. Ok, so now we have our animation set, values are assigned to translation offset, but what’s missing? Actual animation running. Where should we start animation? Here we’re checking for two conditions. The first situation is when our cart value was previously 0, that means we have to show our cart bar (so call forward() on animation controller). The second situation is when new cart value is 0, so we need to hide the cart bar (call reverse() to play animation in the opposite direction). Let’s check how it works! Cool, it’s the end! Hmm.. Is it? Actually, we could stop right here and end the article. We achieved what we wanted. But hey, we’re Flutter developers, we know that everything is a widget in Flutter, so… maybe there’s already a Widget that can make this whole “didUpdateWidget()” job for us? Of course, it is. A container that gradually changes its values over a period of time. The AnimatedContainer will automatically animate between the old and new values of properties when they change using the provided curve and duration. AnimatedContainer is, as the name suggests, a Container widget that can be animated. If you’d like to read more about it (or see cool animations that can be done with it!) you can check this great article from Pooja Bhaumik: Flutter Animated Series : Animated Containers. The fact that’s the most interesting for us is that AnimatedContainer uses didUpdateWidget method under the hood, so it does all the job for us. Let’s try it! As you can see, we needed to add two parameters to our newly created AnimatedContainer — duration for the animation and transform value with translation. 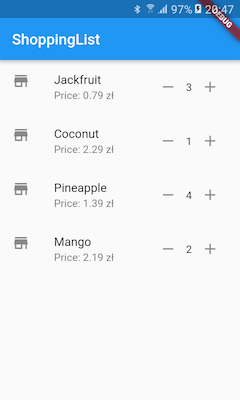 If cart value is different than zero, translation value is zero (container is at the bottom of the screen), if cart value is bigger than zero, translation value is equal to bar height (container is under the screen). Whenever this widget is updated (by emitting new store event by Redux), AnimatedContainer changes transform values with nice animation! Ok, that’s the real end of this article. To sum up, we know now how to create simple animations that can be useful when you have Redux architecture. We also know more about AnimatedContainer. Now it’s your turn to transform this knowledge into super-fancy animations with Flutter!